Suite Dreams from £169 at Hotel Du Vin Afternoon tea with a glass of champagne, an overnight stay and a full cooked breakfast for two at Hotel Du Vin! Book Ahead and Stay from £75 at Hotel Du Vin If you're the organised one, book 3-6 months in advance and enjoy a great saving on a room and a 2-course dinner at Hotel Du Vin! Easter Break with Afternoon Tea from £99 at Hotel Du Vin A luxurious overnight stay and a delicious afternoon tea, from just £99 at Hotel Du Vin! Fabulous Fridays from £144 at Hotel Du Vin Enjoy a 3-course dinner, a bottle of champagne and an overnight stay from £144. Bring the weekend in with style at Hotel Du Vin! Time to Spa from £110 at Hotel Du Vin Treat yourself and someone special to a truly luxurious escape with Hotel Du Vin. Dinner, an overnight stay, a cooked breakfast and a 3o minute spa treatment for the both of you, from £110 per person! 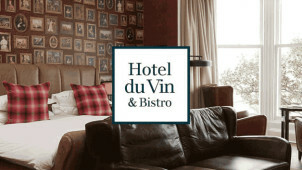 Bank Holiday Stay from £30 Per Person at Hotel Du Vin If you spend £75 in the Bistro, you'll be able to book a room for two, from £30 per person at Hotel Du Vin! Bank Holiday relaxation at it's finest! Dinner for Two Plus a Bottle of Wine from £65 A delicious treat for you and someone special at Hotel Du Vin! When you book a Hotel du Vin room you can expect an extra special stay. Bedrooms and suites are beautifully decorated with calming colours, fabrics and quirky furniture. Little extras like hand-sprung mattresses, roll-top baths, monsoon power showers and Egyptian cotton linen and towels, help to add to the ambience. All this can be yours for a great price when you book your stay with a helping hand from vouchercloud. What’s more with 17 hotels, each with their own character and charm, scattered across the country - you won’t be far from Hotel Du Vin hospitality. At one of Hotel du Vin's trademark bistros you can expect classic French dishes with a British twist and some of the best hand selected wines in the world. Go all out and tuck into 28-day aged Chateaubriand Steak with Pommes Frites and a bottle of Merlot for two, or take a friend or loved one for finger sandwiches, scones and mini sweet delights that make a Hotel Du Vin afternoon tea something worth making an afternoon of! It's the small things that will make your Hotel du Vin stay so unique and memorable. How do I use my Hotel Du Vin promo code? Simply copy a Hotel du Vin promo code and follow the link to their website. Check your code has been applied to your booking and complete the reservation. If there’s a saving to be had at Hotel du Vin, you’ll more often than not find it here on vouchercloud. However, they occasionally offer deals on Meetings and Private events as well as weddings, so don’t plan your big celebration without checking the ‘Offers’ page. Hotel Du Vin York special offers will vary from offers for Cheltenham and other locations, for example, so make sure you select the specific hotel you wish to visit. How can I make a Hotel Du Vin booking? Making your reservation online is simple, just choose all the components to make your stay special and confirm the booking details. You will be asked for your credit card details to guarantee the booking, no payment will be taken until you leave the hotel at the end of your stay. For group reservations and events, it is advised you call to arrange the finer details and make your booking. Do I need to pre-book Hotel Du Vin afternoon tea? To guarantee your table, you will be required to make a reservation at your hotel of choice for afternoon tea. Fill out the enquiry form online, or call your hotel to make a booking. Hurry, the naughty yet nice indulgence of Hotel Du Vin afternoon tea is a popular affair, especially at the weekend! How can I buy a Hotel Du Vin gift voucher? Many people believe experiences are far more valuable than material possessions, and for those loved ones who are minimalist, fussy or simply have everything they could ever need - a Hotel Du Vin stay could be the perfect gift. Celebrate their occasion with a little spending money on a gift card, or splash out on an entire gift experience to spoil them rotten. You can also reach Hotel du Vin online via their contact form, though many queries are handled by the FAQ section. Prepare yourself for a fabulous hotel stay, when you book your break at a Hotel Du Vin. Hotel du Vin are a range of luxury townhouses and boutique hotels which offer their guests a little extra. Perfectionists in the hotel industry, Hotel du Vin describe their hotels as being classic, stylish and quintessentially British.Why not book today using an exclusive Hotel du Vin promo code from vouchercloud. With gorgeous rooms, delicious food and hand-selected wine, your stay at a Hotel du Vin will be unforgettable. It’s not just the luxurious hotel rooms which makes a Hotel Du Vin stay so desirable. The ‘Classically French. Undeniably British’ menu served in their sophisticated bistros will certainly have your tastebuds in a whirl, created by talented chefs who make each ingredient shine in perfectly harmonious dishes. Expect a la carte dining in warm, romantic settings - it won't cost the earth with a Hotel du Vin promotional code and it is the perfect way to make the most of your stay. When the desire for escape becomes too big to ignore, you don’t have to fight your budget to book a blissful break away from the everyday. Book a ‘Fabulous Friday’ package to indulge in an overnight hotel stay with a 3 course dinner and a bottle of champagne to toast your escape. The best bit? Prices start from as low as £143! Pick up a Hotel Du Vin voucher to make the most of this offer, and choose from Hotel Du Vin & Bistro Hotels including but not limited to Birmingham, Brighton, Newcastle, St Andrews, and Edinburgh.